My Tamagotchi Forever : Raise your very own Tamagotchi characters, and share your adventures with your friends! Your Tamagotchi character needs your daily care to stay healthy and happy. Keep it well fed, washed, and entertained, then meet other Tamagotchi friends in town for more fun. But don’t forget to put your character to bed! Take good care of your Tamagotchi characters and watch them grow! Play mini games, make friends, explore Tamatown and customize outfits and the town itself for memorable moments you’ll want to share with your friends. Depending on the care you provide and the things you do, they will evolve into different Tamagotchi characters as they grow. And when they are all grown up, help them choose the best career path, be it scientist, rockstar or detective! 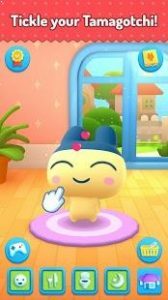 HAVE FUN with your Tamagotchi character: play mini games and explore Tamatown together, making friends with other Tamagotchi characters along the way. GATHER coins by playing mini games and levelling-up! PLEASE NOTE: My Tamagotchi Forever is free to download and play, however some game items are available for purchase. If you don’t want to use this feature, please disable in-app purchases in your device settings. A very cute game indeed. Relaxing to play I just wish there was more things to do with your creature. Some more mini games might be a good idea but also it would be great if they expanded the town a bit. I really like the idea of growing the Tamagotchis to adulthood and then you can get a new one. I love the graphics, music, and sound effects and the fact that the game retained the good old features of taking care of the characters as well as mini-games, buying food, clothing, and playground gadgets. I also like being able to level up and unlock items and go to different parts of tamatown. Nevertheless, I feel the game could be made even better. The one thing I don’t like is I can’t do anything while the character is sleeping. I was hoping to at least be able to see what items are available for purchase at the store once my character wakes up, or what part of town I have yet to discover. A map of the town would also be cool. Countdown to Christmas! This month has many fun and limited time contents to explore! Visit our Christmas Tree in Tamatown and open free gifts all month long. You will earn exclusive items! It’s snowing in Tamatown! Photograph wintery memorable moments before it melts away. Get festive! Decorate your house with all new furniture. Don’t miss the Mametchi’s exclusive Santa hat in the shop!